Guatemala is a beautiful country in Central America located just below Mexico. If you visited the country you would see Mayan ruins, the remains of one of the greatest cultures. It is uncertain why the culture collapsed. Some think there may have been catastrophic* events such as volcanos, earthquakes, or hurricanes. Perhaps disease wiped out the population. The poor people of Guatemala and many other underdeveloped* countries spend their days gathering firewood to cook their meals and heat their homes. After they have cut all the trees close to their homes they have to travel farther and farther just to find wood, then they must carry it long distances to get it home. The heavy loads injure their backs and they have little time left to do other things except look for firewood. Deforestation* occurs and the land which has been cleared of trees becomes subject to erosion,* and the wind and water carry the soil away. For generations their cookstoves have been built with three stones. They move the stones just the right distance apart to accomodate whatever size pot they are using, then they build the fire in the middle of the stones. It doesn't cost anything to build one, but there are several problems with the three-stone stove. Children are injured and suffer terrible burns when they fall into the fire. The stove, when built inside the house, causes the house to fill with smoke and damages the eyes and lungs of the people living in the house. 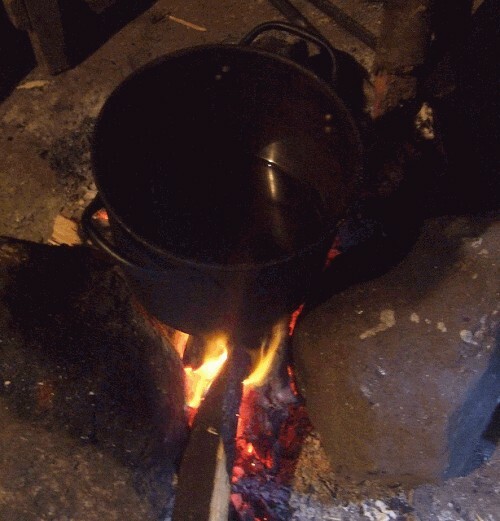 The open fire uses a lot of wood because the wood burns faster and the stove is not efficient. Don O'Neal, a retired mechanical engineer, volunteered to do relief work in Guatemala. He was traveling in the jungles and working as a photographer with a medical missions team called HELPS International. People who had been injured in the fire came to them for help. Don began to study the problem and determined to find a solution to the open fire that was so detrimental to the people of the area. The fire needed to be enclosed and raised off the floor level so children could not accidently fall into it. They needed a safer stove. He started searching for one, but couldn't find anything that would meet their needs, so being the engineer that he was, he invented a stove that would be safe for them to use, would direct the smoke outside the house, and would be economical* to build. But the people had cooked on the three-stone stove just as they had learned from their mothers and grandmothers. Would they accept a new kind of stove? Don was pleasantly surprised to find that the women were anxious to accept something that would make their lives and the lives of their children better. There was no hesitation in their acceptance of this newfangled* stove. It was just what they needed! 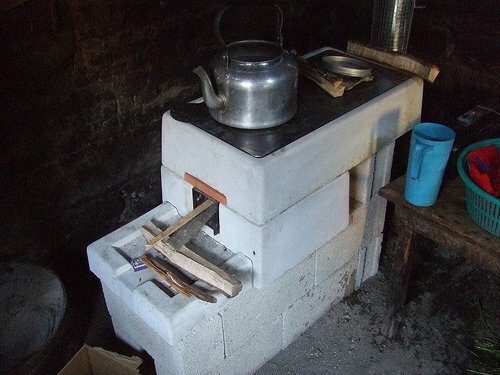 The stove is made of cast concrete blocks that can be assembled right in the spot where they want to build the stove. The homeowner helps the volunteer build the stove so he understands it completely. If they move to a different place, it's an easy matter to move their stove with them. The stove uses 70% less wood than open fires, so they don't deplete their forests as rapidly, and they don't have to travel so far to get wood. Building the fire and cooking does not take as much time and the women are free to do other enjoyable things. The ONIL stove is produced at a factory in Rio Bravo, Guatemala. The "factory" is actually just two open-air sheds. In one of them they make the tiles and set them to dry and from the other one they load the tiles and send them all over Guatemala. Over 110,000 stoves have been distributed in Guatemala and Nicaragua. The current price is $122(US dollars). 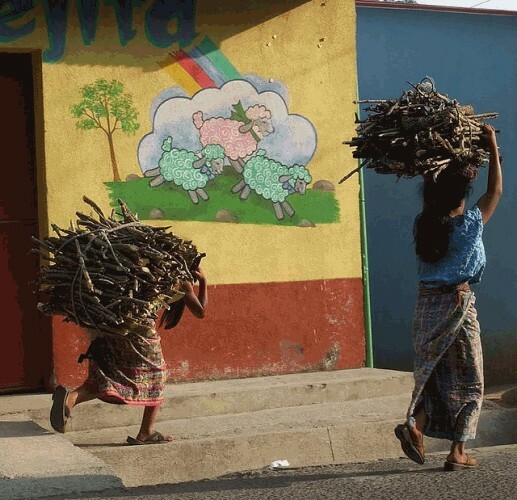 The Maya Relief Foundation provides interest-free loans to the people to buy the stoves. In 2004 Don O'Neal received the Ashden Award for the development of the ONIL stove. 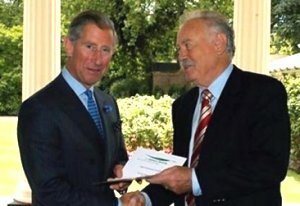 Prince Charles presented the award to him. Also in 2004 he received the "Volvo for Life" award from the Volvo auto makers. Those so honored receive $50,000 to be awarded to their favorite charity and a Volvo car for life. In 2007 he was among 25 innovators who received awards at the Tech Museum of Innovation* in San Jose, Silicon Valley, California. He was honored with the Health Award for reducing respiratory deaths in Guatemala. O'Neal and the volunteers who help to install the stoves have made a tremendous difference in the lives of the people of Guatemala and other countries where the stoves have been installed. This biography by Patsy Stevens, a retired teacher, was written December 10, 2011. Lesson - What is Deforestation? This page displayed 17,217 times.